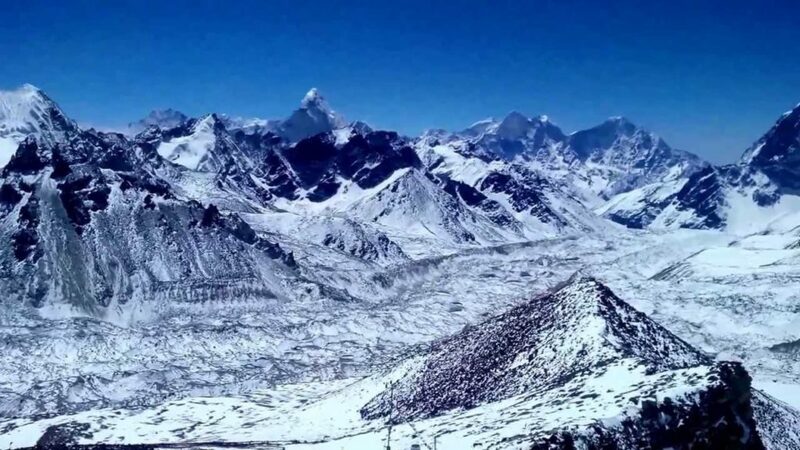 Everest High Passes Trek is one of the most famous and adventurous trekking trail that combines the three high passes of the Everest region namely Kongma La (5535m), Cho La (5420m) and Renjo La (5340m). 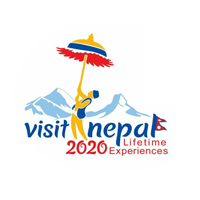 Everest high passes trek provides you a great opportunity to visit the Everest Base Camp, Kala Patthar, Gokyo valley and its serene lakes along with a lot of Himalayan attractions. Further the Everest High Passes Trek lets you discover a route to the remote and untouched Nangpa La Valley, the Sherpa village of Marlung, the monastery village of Thame etc. Travelling through the classical trail makes complete high-level circuit through world famous passes Kongma La, Cho La and Renjo La. The Everest High Passes Trek provides the most spectacular views of the towering mountains and beautiful remote valleys of the Khumbu region. Along with the natural beauty you will also get to discover the Himalayan culture, tradition and the lifestyle of the people living in the Himalayas. If you are daredevil and real adventurer looking for more of a challenging trek crossing some of the most famous passes in the world, Breakfree Adventuress Everest High Passes Trekking (Everest Three Passes Trekking) is an ideal choice for you.Our journey to the Everest High Passes Trekking begins with a sightseeing day in Kathmandu that offers a short exploration to the historical and cultural attractions of Kathmandu and its vicinity. We board a mountain flight that lands us to Tenzing-Hillary airport at Lukla. Lukla is the starting point of our trek expedition. We begin following days by ascending through the classic route to the Sagarmatha National Park. As we trek the trail unveils mighty Dudh Koshi River, diverse landscapes, beautiful villages and the awe-inspiring views of the Himalayan range. After reaching the summit of Kongma La (5535m) as we lead our way to the Everest Base Camp we will see the beauty of Khumbu Ice fall. Our trek to the view point of Kala Patthar is followed by a though climb via Cho La that eventually takes us to the cobalt blue lakes at Gokyo. After enjoying the breath-taking views from the fifth lake and Gokyo Ri, we make our way to the next great pass, The Renjo La. A Night’s stay in Marlung and following a route used for centuries by the Tibetan traders via Nangpa La takes us to Thame. Following the classical route we descend down to Lukla and fly back to Kathmandu wrapping up our long expedition. Today is yet another scheduled day for acclimatization. Trekking experts strongly recommend acclimatization in Chhukung before marching for Kongma La Pass. We will be active throughout the day exploring Chhukung. The views from Chhukung and above on the moraines towards the Island peak is simply breathtaking. We will also take the opportunity to climb and explore Chhukung Ri or climb to the base camp of Island Peak. The magnificent views of Mt. Lhotse, Amphu Lapcha and other Himalayan range have added more beauty in this region. Overnight, we stay at the guest house. Today we would be ascending the highest pass of expedition; Kongma La Pass. We start early in the morning after breakfast and continue our trekking. Make sure that you carry plenty of water, some snacks and packed lunch to quench your hunger as there are no tea shops on the way. 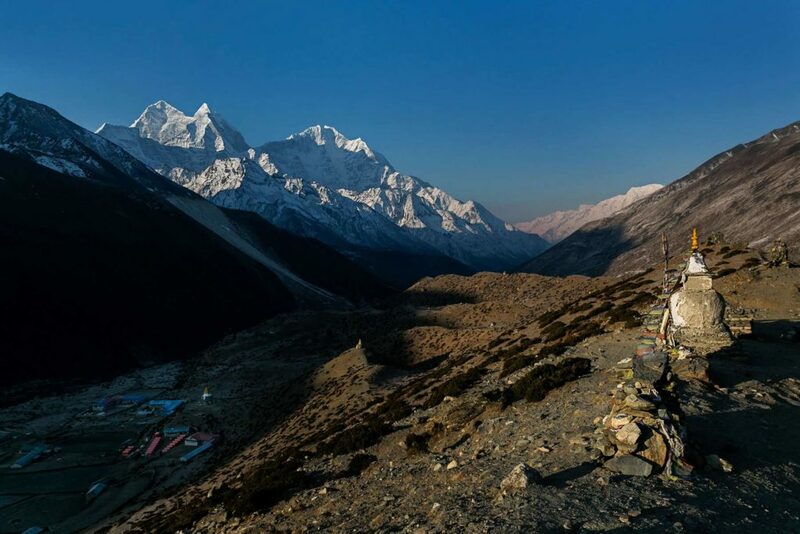 The trail is absolutely exquisite and worth walking enjoying the nature of the Khumbu region. 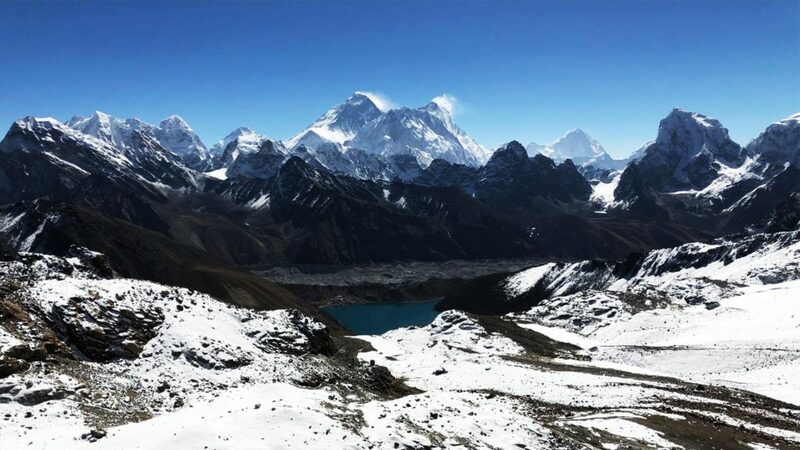 The trail offers two options whether you wish to climb over the hill northwest of Chhukung over the moraine of the Nuptse Glacier or walk back to Bibre and follow a high trail above the Niyang Khola. Few hours of walk lets you discover the beauty of Island peak viler and ridge if Amohu Lapcha. Ascending through Niyang Khola valley, turning west and a continuous walk through the stony trail takes you to a wide basin filled with small frozen lakes. The trail further leads us to Kongma La. After reaching the top of Kongma La we can see marks of the pass; cairn wrapped in prayer flags. 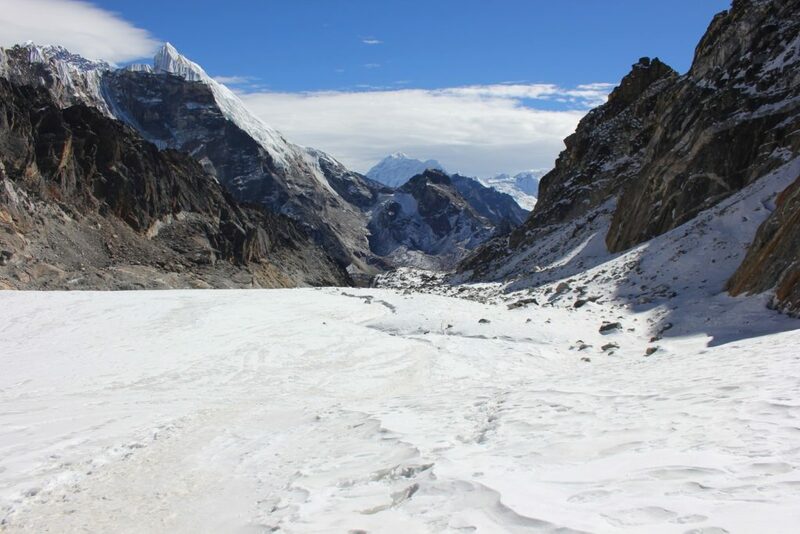 Khumbu glacier is yet another attraction of this region. We will continue or trek turning north through Khumbu Glacier which takes us to Lobuche. Overnight, we stay at the guesthouse. We will be having a short and relaxed trek today. We have set our destination to Dzongla for the day. Leaving Lobuche behind we follow the trail crossing a stream and ridges that leads to Dzongla. As we walk we can see soaring heights of Mt. Ama Dablam and Mt. Thamserku. We can also see Mt. Taboche peering at a distance. The village of Pheriche looms in a distance offering a great view. The trails also offer the scenic view of Chukpi Lhara and its memorials. We pass through Chola Laka below Cholatse and the trail later climbs up a spur and further descends steeply to a wide basin. A steady walk from the basin and crossing a shaky bridge finally lands us to Dzongla. Overnight we stay at Dzongla in a guesthouse. Today we gear up for our expedition to one of the high passes of the Everest region; Cho La pass. We set off early in the morning after breakfast. Today is probably going be a toughest day of our expedition. We will follow the trail that descends to a basin across the icy streams via which we reach the top of the basin and further set off to invade Cho La. We move on ascending the rough trail enjoying the beauty of Chola Lake. As we gain height we witness the soaring Ama Dablam on the south and Cholatse on the west. We have to be very careful as we scramble further through the rocky trail. The rocks can be glazed by ice so being alert is very important. Climbing Cho La is really a tough job but worth climbing. Upon reaching the top we can see the prayer flags flapping in the strong wind. The awe-inspiring view that it offers is really something that leaves your eyes wide open. The rocky trail leading down to Thangnak can easily made out from the pass but cautiousness is required as rocks are glazed by ice. After few hours of walk we will find ourselves in Thangnak, a small village. As we walk further leaving Thangnak behind, we can see admirable views of beautiful mountains and the Himalayan range. A short walk will later take us to Ngozumpa glacier (longest glacier in Nepal). Walking further we find ourselves in Gokyo village where we stay for the night. Today is yet another rest day of our expedition. We would rather walk for few hours and stretch our muscles instead of sitting idle. We would climb Gokyo Ri to enjoy the majestic scene from the best viewpoint of the Everest region. After hiking for a couple of hours we reach the viewpoint of Gokyo Ri. The viewpoint offers astonishing views of Mt. Cho-Oyu, Mt. Lhotse, Mt. Nuptse, Mt. Makalu along with mighty Everest. We would also exploring some lakes of this region. 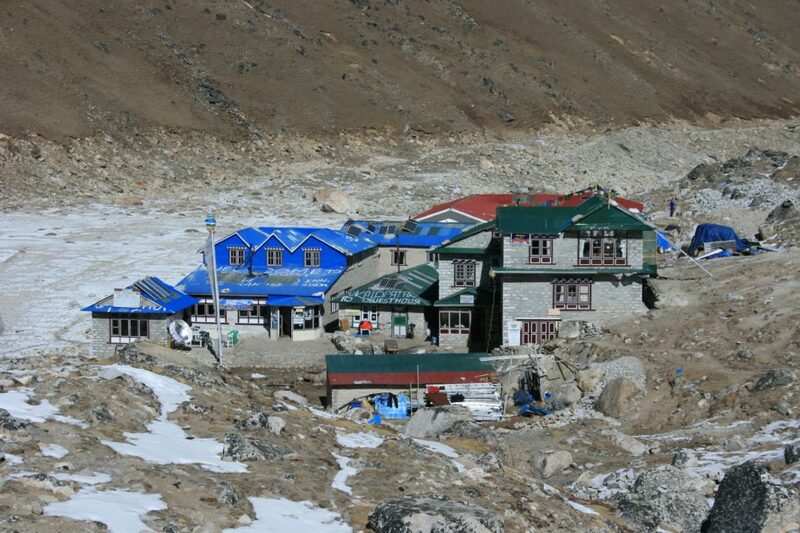 We can also enjoy the scenic view of Cho-Oyu base camp and the biggest glacier of the world; Ngazumpa Glacier. After discovering the scenic Himalayan views we descend down to Gokyo . O/N we stay at a guest house. For Everest High Passes Trekking we allocate one guide, an assistant guide (6 trekkers: 1assistant guide) and porters for carrying the luggage (2 trekkers: 1 porter). We make sure that the trek expedition will still go ahead as planned if any of the group members falls sick. We operate the Everest High Passes Trek for any group size but generally a largest group consists of sixteen people. We also make customized group size as per your requirement. Our day begins with a cup of tea or coffee in the morning. After freshening up we have our breakfast and gear up for our expedition. Everest High passes Trek is requires a minimum of 4-8 hours of walk everyday so we have to plan our daily itinerary accordingly. After 2-3 hours of trekking we take a break for lunch somewhere in the trail (restaurants if available). We take frequent rest en route to rejuvenate our expedition. We also halt in many places to capture the scenic view of the Himalayas, beautiful rivers, landscapes, monasteries, cairns etc in our cameras. Our day’s trek ends once we reach our destination as planned in the itinerary. Once we arrive at the guest house, we take a brief rest, take shower and enjoy a light snacks with tea or coffee. We may choose to hang around the local village and community if we have a leisure time. We would be delighted to witness the culture and traditions of the people living in the Himalayas. We will have ample time to chat with our crew members before going to bed. Dinner is usually followed by a next day’s itinerary briefings by our trek leader. You have all the good reasons to drink available locally made alcoholic liquors. Finally you can catch up your bed for a good night sleep. Autumn (Mid September-Mid December) and Spring (March-May) are the best season for the Everest High Passes Trek. The weather during the season is sunny and warm during the day that offers you to enjoy the magnificent view of the Himalayan range whereas the nights are chilling and cold and can fall to freezing in the higher elevations. Winter (Dec, Jan and Feb) is also ideal for EBC trek but cold is something that bothers you during these seasons. Trekking during summer will be affected by rain but summer trek could be a boon of a keen botanist as the vegetations bloom in this reason. The trekking routes are always busy with trekkers during spring and autumn but during monsoon and winter the routes are not packed and crowded and you can have a great journey enjoying the scenic views. 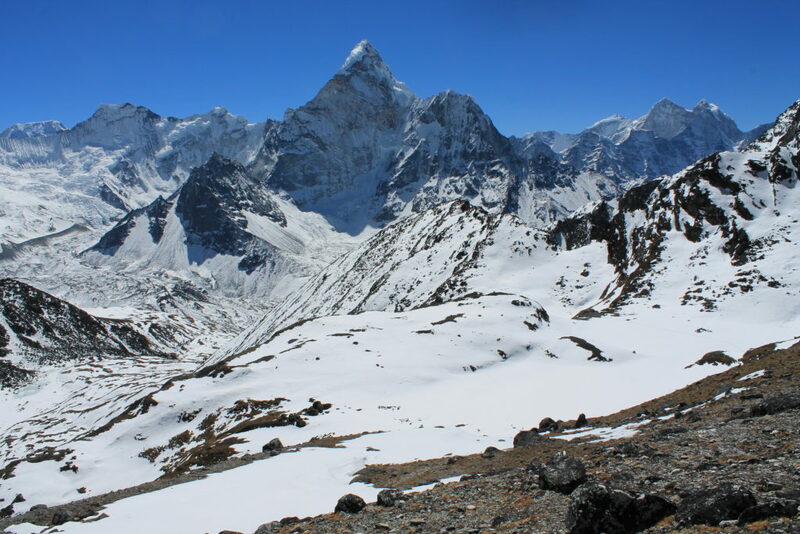 Our twenty days Everest High Passes Trekking is moderate to strenuous trek suitable for passionate trekkers who have the ability to walk at least four to eight hours a day. Walking in higher altitude is rather challenging and it requires a lot of physical caliber. A good physique, positive altitude, self confidence and strong determination are the keys to success to successfully accomplish the Everest High Passes Trek. Prior preparation like walking or jogging few hours a day before starting your trek is beneficial and it simplifies your expedition. Past hiking experience would be an asset but not mandatory for Everest High Passes Trek. Participants with chronic illness, physical disorder, heart, blood and respiratory disease are strongly advised to inform Breakfree Adventures before booking the trek. Consultation with a medical professional is highly recommended before starting your trekking adventure. Breakfree Adventures twenty days Everest High Passes Trek is planned with high degree of awareness about Acute Mountain Sickness (AMS). Trekking in the higher altitude too fast might cause a medical condition serious enough to cause death. The level of oxygen fluctuates as the height increases. For example, at an altitude above 5000m, there is 50% less oxygen than at sea level. Our body requires many days to adapt the less-oxygen environment so the itinerary should be planned accordingly. Our itinerary is planned in such a way that it provides sufficient time for acclimatization. Sensible trek plan is therefore very crucial to minimize the risk of AMS. Breakfree Adventures highly advises specially the person with known heart, blood or respiratory diseases to consult their medical professional before travelling. Mild headaches, fever, loss of appetite or stomach disorder are symptoms of AMS. Our leaders are well trained to administer the AMS. Breakfree Adventures’s itineraries are designed to avert the risk of AMS as much as possible. We do not compromise on safety and security of our guests. We highly prioritize safety and security measures during the Everest High Passes Trek. We have to understand that there are certain risks while travelling in higher altitude which you should consider before booking. Our trip operators constantly monitor their areas of operation and trekking trail and they would cancel or re-route a trip if they feel any destination is unsafe to travel.